Search Results for "ultrasound image"
An ultrasound screen with a black and white image. Colourful video of modern ultrasound monitor. Ultrasonography machine. High technology medical and healthcare equipment. Ultrasound imaging or sonography used in medicine. Colourful video of modern ultrasound monitor. Ultrasonography machine. High technology medical and healthcare equipment. 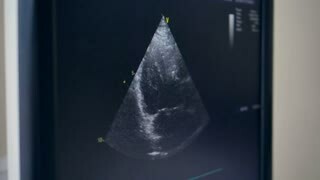 Ultrasound imaging used in medicine. Human heart. Four chambers view. Colourful video of modern ultrasound monitor. Ultrasonography machine. High technology medical and healthcare equipment. Ultrasound imaging or sonography in medicine. Woman's womb during pregnancy. A doctor pressing buttons on ultrasound machine, and tilt up to screen with ultrasound image. Close up of an ultrasound image of a baby. Real image of a unborn in the womb. Close-up shot of pregnant woman's belly and female hands holding ultrasound image of healthy unborn child. Pregnancy, medical care and happy family concept.